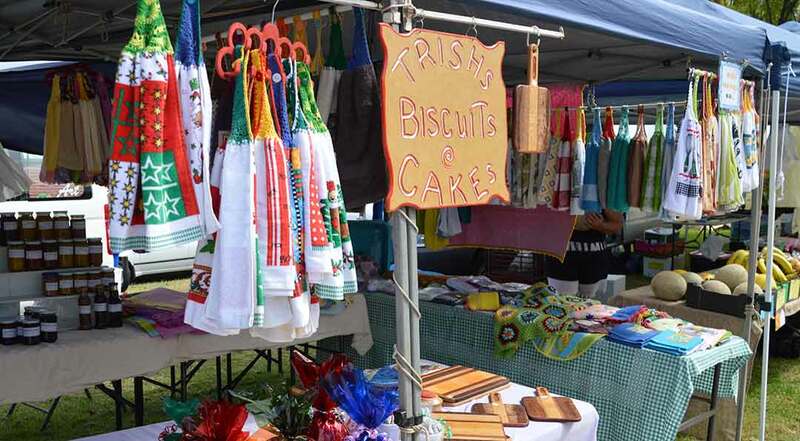 The Wondai Country Markets are getting bigger and better every month. Managed by the Wondai Regional Art Gallery, the markets operate in Coronation Park, MacKenzie Street, in the Wondai CBD every fourth Saturday of the month, from 7.00am til 12noon. The markets include stallholders selling fresh fruit and vegetables, arts and crafts, useful knick-knacks, great gifts and goodies, clothing and more. There is live entertainment with locals firing up the BBQ from 7.00am to dish out hearty breakfasts to the early bargain hunters. New stallholders are always very welcome. Stall fees range from $10 with power, and water available if needed. The new ‘Studio’ is located within the market area at the Wondai Regional Art Gallery. The ‘Studio’ welcomes stallholders with an offer of a table (1.8m x .75m), in air-conditioned comfort, for just $5. The only stipulation is that the goods must be handmade and/or homemade. Why not come and enjoy a Devonshire Tea provided by the QCWA in the relaxing forecourt of the new ‘Studio’. If you would like to book a site at our market, please phone Joan or Eric on 0456 999 928. For any other inquiries or general information please phone us at the Wondai Regional Art Gallery on (07) 4168 5926. Visit our Wondai Country Markets website.